Haberimix.com is a search engine that might hold some risks with regard to your system’s security. Not realizing the issues that might emerge from the presence of this search engine may lead to more malware infections on your PC or worse. Landing on questionable websites is one thing; if Haberimix.com is set as your home page in your browsers, it is quite possible that there are a few other threats lurking on your computer. If so, removing Haberimix.com will not be sufficient to secure your computer, you will also have to eliminate all the other infections as well. Please read on to find out more about this search engine and how you can resolve the emerging issues. Haberimix.com may be set as your new home page in all major browsers, including Mozilla Firefox, Google Chrome, and Internet Explorer, when you install a freeware bundle that you have downloaded from a shady file-sharing website. Keep in mind that installers packed with malware programs are commonly promoted on such websites. It is enough to click on the wrong button if you are not familiar with the site, and that may result in such a bundle on your computer. If you want to avoid that, please stay away from unfamiliar or suspicious file-sharing websites. You also need to be careful whenever you install a bundle since that is when you can still say no to certain components of the package. For example, in this case, you can deselect Haberimix.com as your new home page so that it will not be installed and your problem is solved. If you ignore this stage, you may be facing several threats that may require your immediate attention. After you delete Haberimix.com, you had better run a reliable online scanner to see how many more infections are threatening your system. 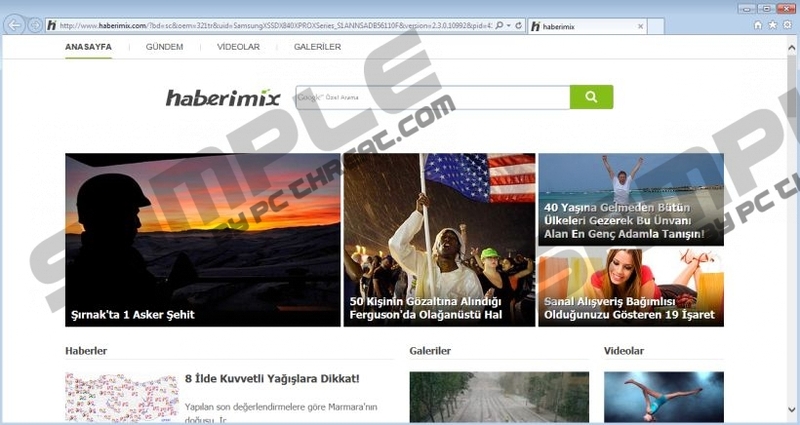 Haberimix.com is a Turkish search engine, which does not mean you cannot install it anywhere in the world. When you enter a search query using this engine, you will be redirected to Google.com; however, it will not be the usual Google results page, this is a customized one. This search engine might have the capability to alter the search results and inject third-party links that may also be tailored to suit your needs or interests. How is that possible? Well, this search engine can collect information about you and even use your search queries to determine what you are interested in most or what kinds of products you usually buy. The only problem is that you can never be certain that the linked websites are reliable ones or not. A lot of people infect their systems or get scammed this way, i.e., by clicking on unreliable ads and landing on malicious websites. Are you convinced now to make the right decision regarding the fate of Haberimix.com? It is definitely easier to remove Haberimix.com than to find any reason to keep it on-board. You can get rid of it simply via Control Panel. You do not have to be an IT expert to handle this task. Follow our instructions below the article if you want to defeat this infection manually. But what about the other threats that may also be on-board? If you do not deal with them, they might easily turn your system upside down, and that never ends well. It would be rather difficult to go after them one by one and eliminate them manually; even for an expert. That is why it is best to use a trustworthy antimalware application. With such a security tool it is a piece of cake to fight the battles against malware infections. Do you think your computer deserves this kind of protection? Click on the Windows button in the bottom-left corner and access Control Panel. Quick & tested solution for Haberimix.com removal.